dbnAudile completed the design, supply and installation of lighting and rigging for the new “Da Vinci – the Genius” exhibition at the Museum of Science & Industry in Manchester. dbnAudile were hired by Grande Exhibitions from Melbourne Australia and MOSI, and the project was designed and managed by Nigel Walker of dbnAudile. 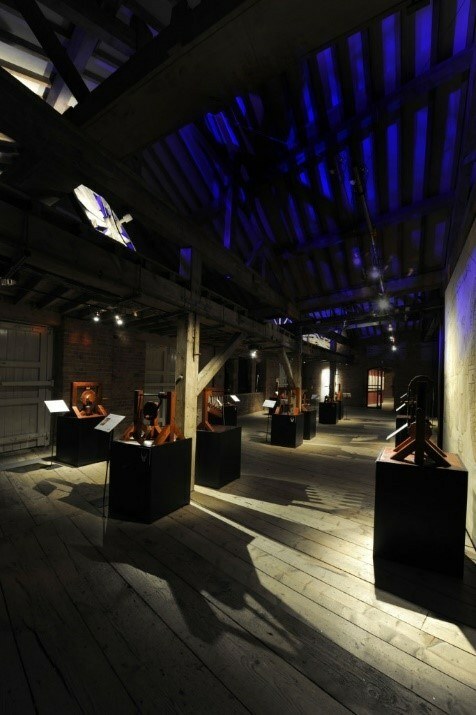 The Da Vinci Exhibition occupies most of the top floor of The 1830 Warehouse, a Grade 1 Listed timber frame building, originally completed in 1830 as the Manchester terminus of the Liverpool & Manchester Railway. ‘Da Vinci – The Genius’ features 4 rooms, some sub-divided and a small theatre space that the dbnAudile team created with rigging and drapes, plus a separate area devoted solely to the Mona Lisa. The major challenge was in rigging all the equipment without actually attaching anything directly to the building’s superstructure, and completing the installation within the stringent guidelines for preserving its integrity. Traditional fastening methods were therefore out, and points had to be created by carefully clamping around the main beams or via ‘soft’ suspension systems utilising steels clad with re-enforced flexible tubing to protect the wooden beams. The lighting rig consists entirely of MR16 “Birdies” – over 260 of them in total – of varying wattages and beam angles. They are fitted with different frost and diffusion filters to add depth, mood and perspective to the exhibits, which are a mix of graphics panels, wooden models, prints and paintings. There are only two colour filters used in the whole exhibition, which is Lee 203 1/4 CT blue, illuminating one picture, and producing a dramatically different effect. All the lighting runs off the existing house power distribution system with no need for additional control. The dbnAudile team were on site for a total of 3 weeks completing the work. The exhibition is open until June 2010, and is one of 4 exhibitions in different parts of the world.